With a unique design and eco-friendly concept, Sleepbox Sukhumvit 22 features free WiFi, a shared kitchen, and a common area equipped with an electric kettle, a microwave, a refrigerator, and kitchen wares. Free drinking water and complimentary mini breakfast are provided for all guests. A 10-minute walk brings guests to Phrom Phomg BTS station and to the EM District in which modern and famous department stores are located. Suvarnabhumi International Airport is a 40-minute drive away from the property. The room is air-conditioned and each bed comes with a privacy curtain and a private locker. 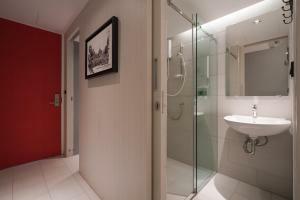 A shared bathroom with a shower is located inside the dormitory. Rate: THB 355.23 ... THB 3710.99; select dates below to get current rates. This private double room features a flat-screen TV, a sofa and a private bathroom with a shower. Rate: THB 353.52 ... THB 3727.20; select dates below to get current rates.